Son las __(the number)_______. For example: It is 3:00. Son las tres. It is 11:00. Son las once. 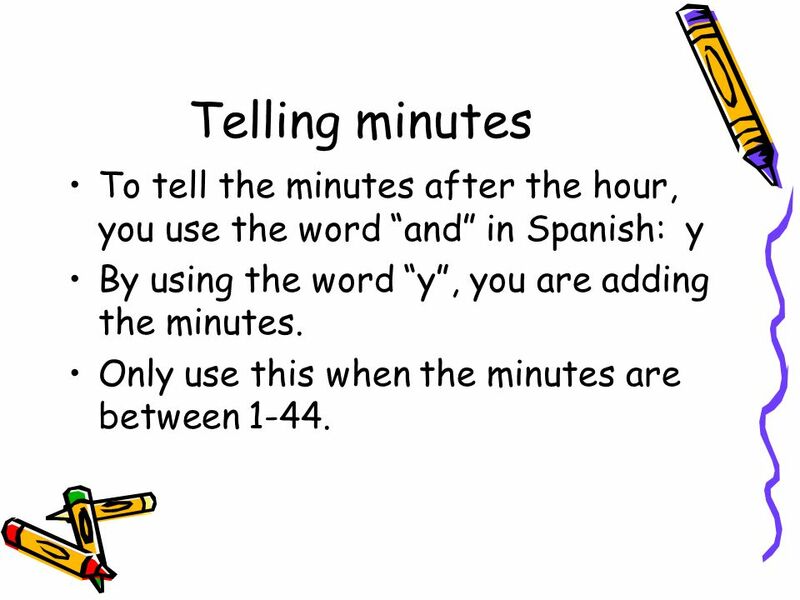 4 Telling minutes To tell the minutes after the hour, you use the word “and” in Spanish: y By using the word “y”, you are adding the minutes. 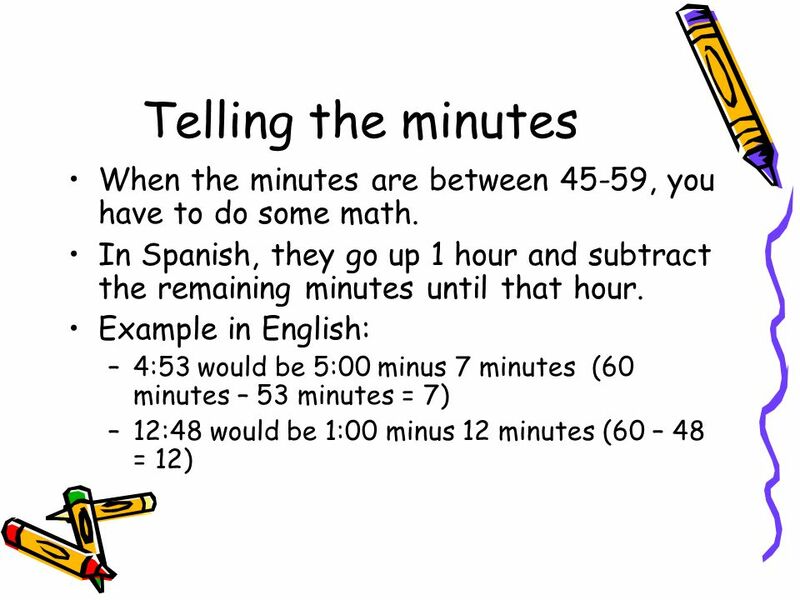 Only use this when the minutes are between 1-44. 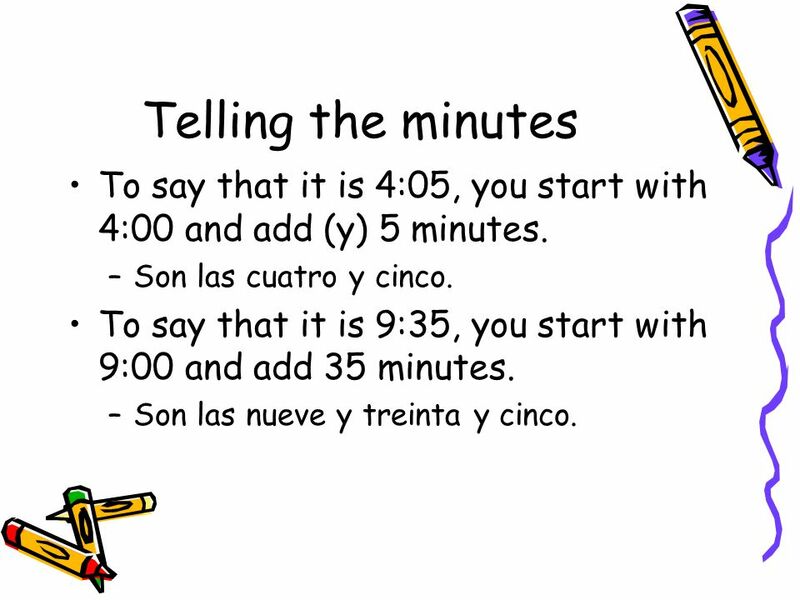 5 Telling the minutes To say that it is 4:05, you start with 4:00 and add (y) 5 minutes. Son las cuatro y cinco. 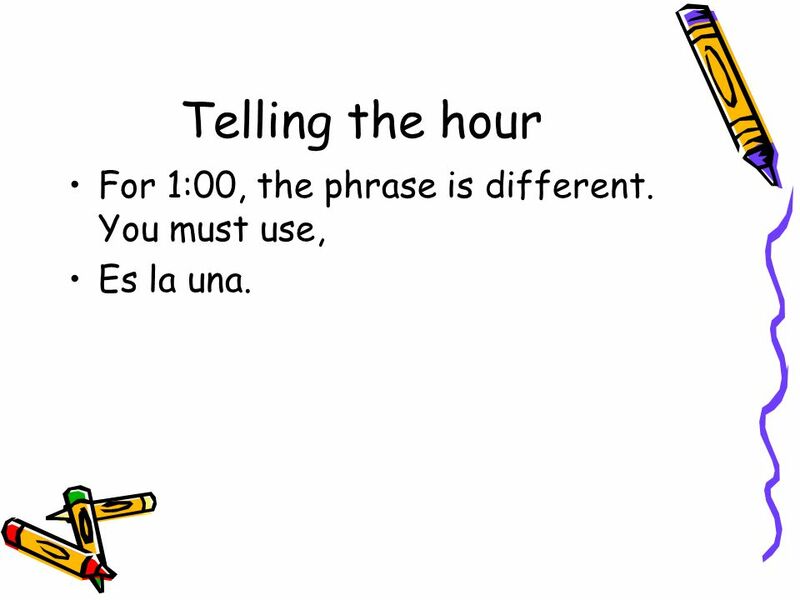 To say that it is 9:35, you start with 9:00 and add 35 minutes. Son las nueve y treinta y cinco. Son las cinco y veinte. 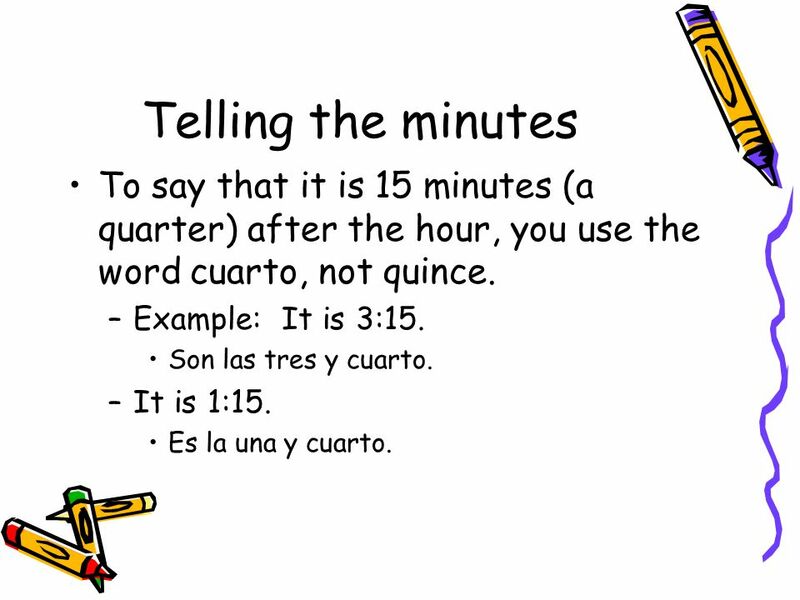 8 Telling the minutes To say that it is 15 minutes (a quarter) after the hour, you use the word cuarto, not quince. 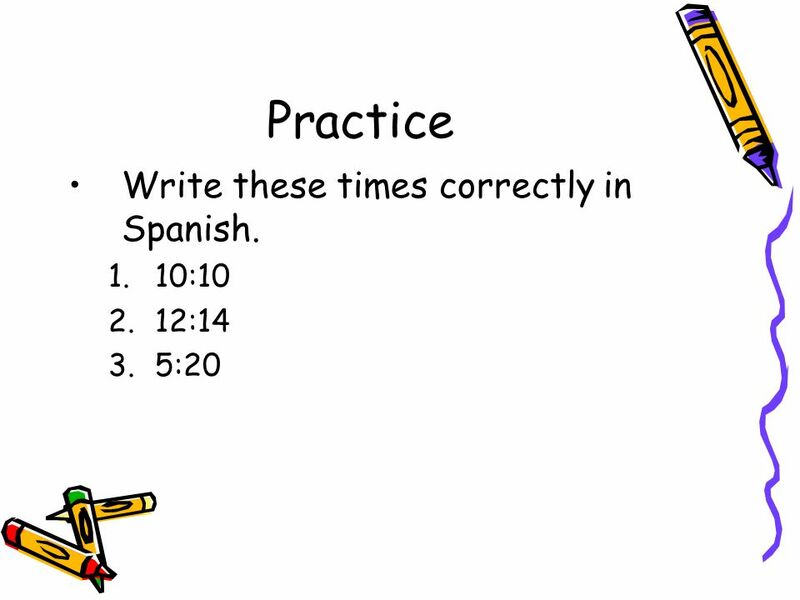 Example: It is 3:15. Son las tres y cuarto. It is 1:15. Es la una y cuarto. 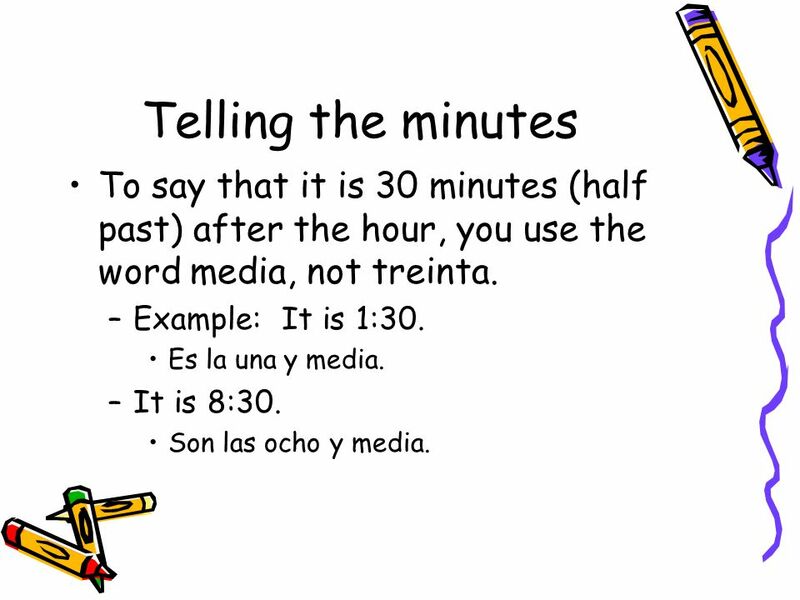 9 Telling the minutes To say that it is 30 minutes (half past) after the hour, you use the word media, not treinta. Example: It is 1:30. Es la una y media. It is 8:30. Son las ocho y media. 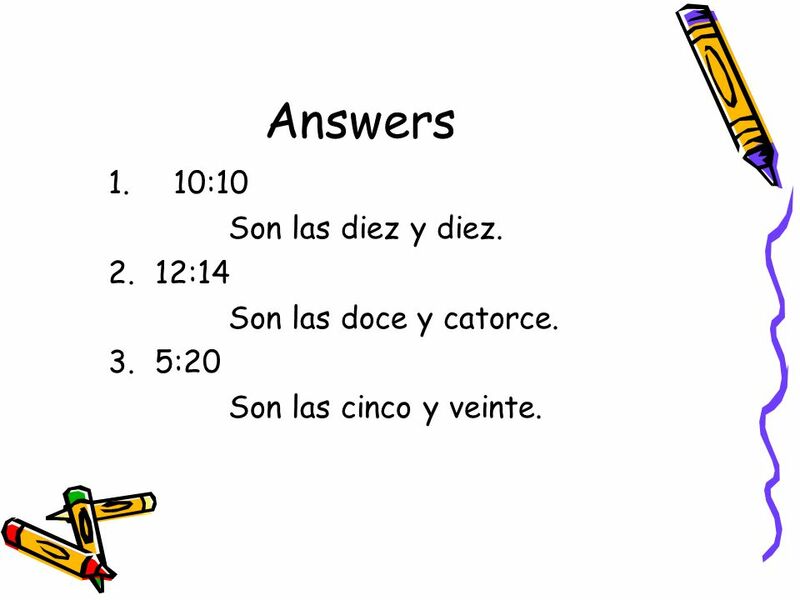 11 Answers 2:15 7:30 8:28 1:40 - Son las dos y cuarto. - Son las siete y media. 8:28 - Son las ocho y veintiocho. 1:40 - Es la una y cuarenta. 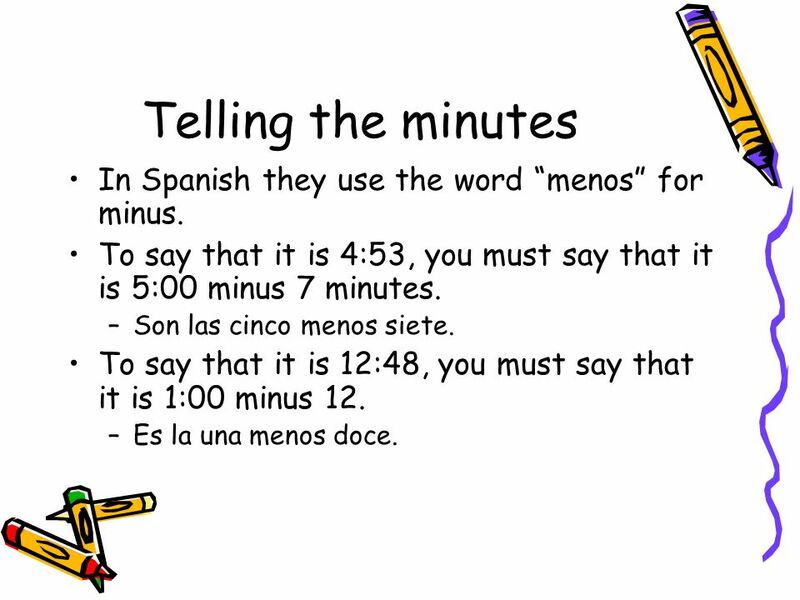 13 Telling the minutes In Spanish they use the word “menos” for minus. To say that it is 4:53, you must say that it is 5:00 minus 7 minutes. Son las cinco menos siete. To say that it is 12:48, you must say that it is 1:00 minus 12. Es la una menos doce. 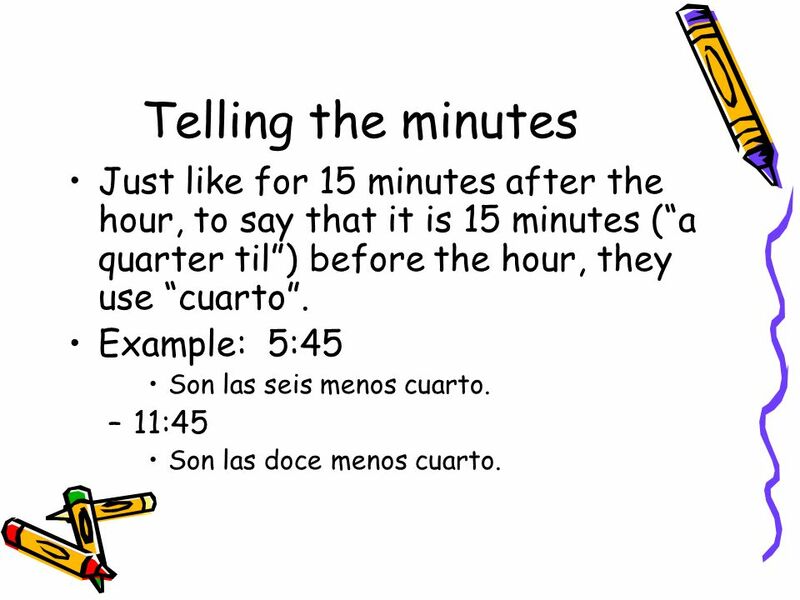 14 Telling the minutes Just like for 15 minutes after the hour, to say that it is 15 minutes (“a quarter til”) before the hour, they use “cuarto”. Example: 5:45 Son las seis menos cuarto. 11:45 Son las doce menos cuarto. 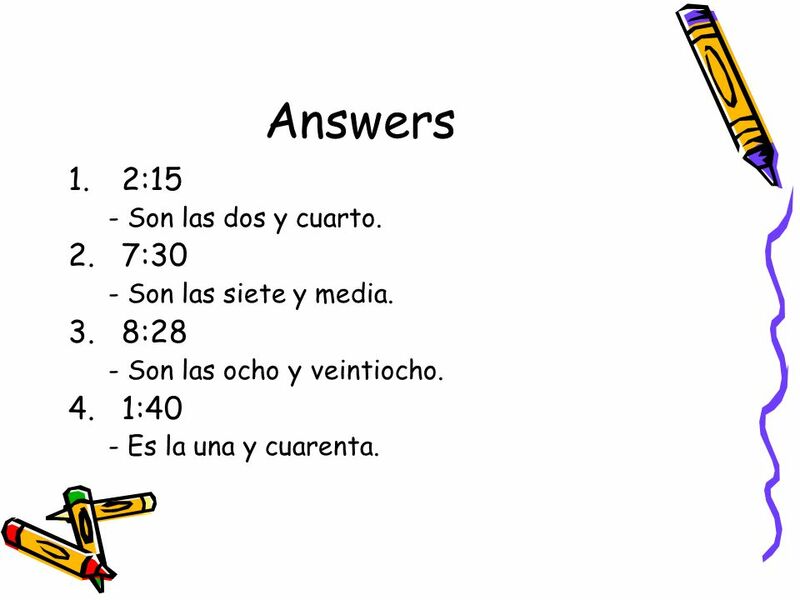 16 Answers 12:55 9:50 3:45 4. 5:47 Es la una menos cinco. :47 Es la una menos cinco. Son las diez menos diez. Son las cuatro menos cuarto. Son las seis menos trece. 17 A.M. and P.M. 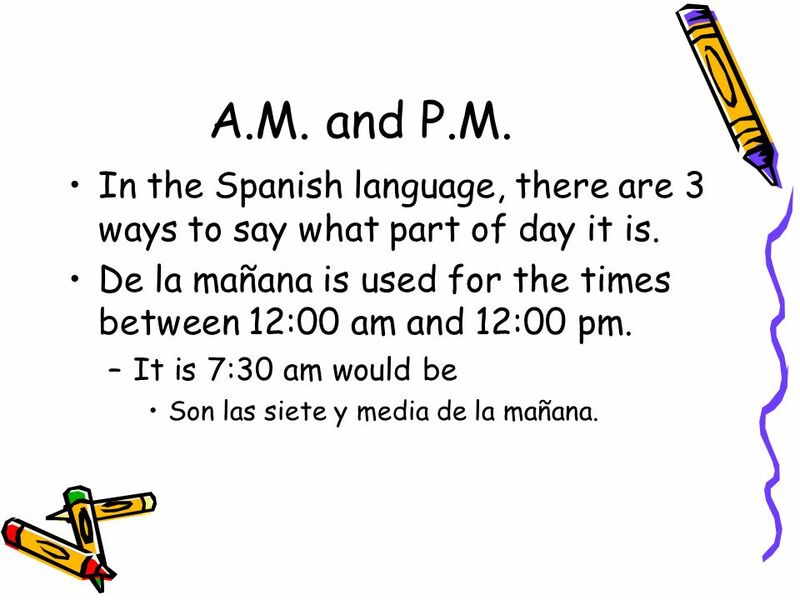 In the Spanish language, there are 3 ways to say what part of day it is. De la mañana is used for the times between 12:00 am and 12:00 pm. It is 7:30 am would be Son las siete y media de la mañana. 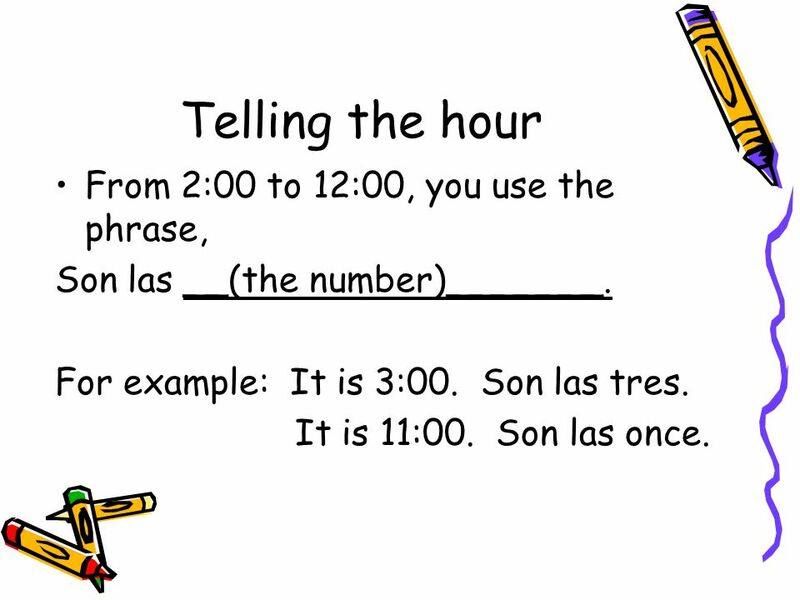 18 A.M. and P.M. De la tarde is used for the times between 12:00 pm and 6:00 pm. 3:15 pm Son las tres y cuarto de la tarde. 5:01 pm Son las cinco y uno de la tarde. 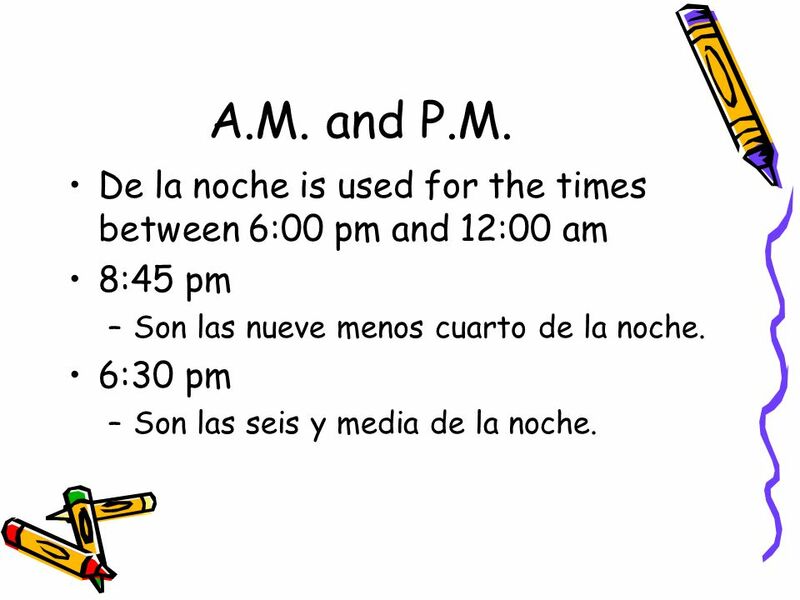 19 A.M. and P.M. De la noche is used for the times between 6:00 pm and 12:00 am 8:45 pm Son las nueve menos cuarto de la noche. 6:30 pm Son las seis y media de la noche. 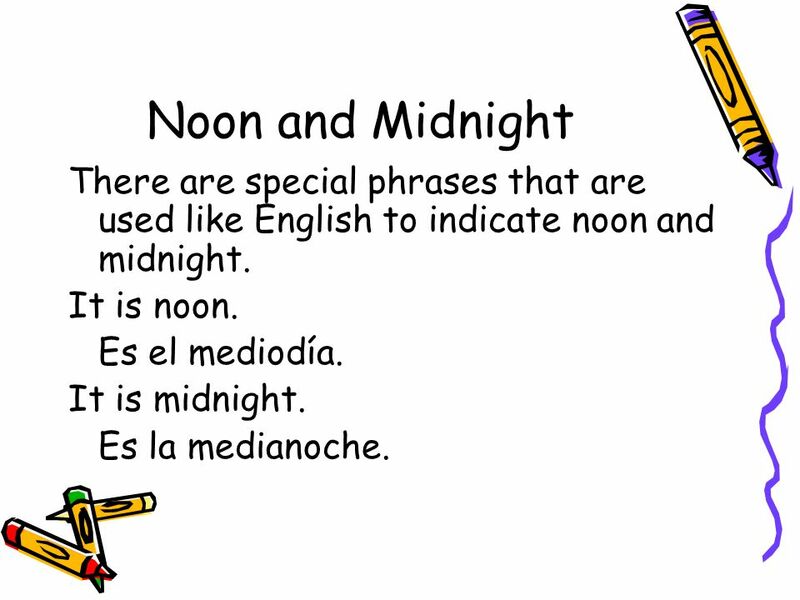 20 Noon and Midnight There are special phrases that are used like English to indicate noon and midnight. It is noon. Es el mediodía. It is midnight. Es la medianoche. 21 Using “at” with time. 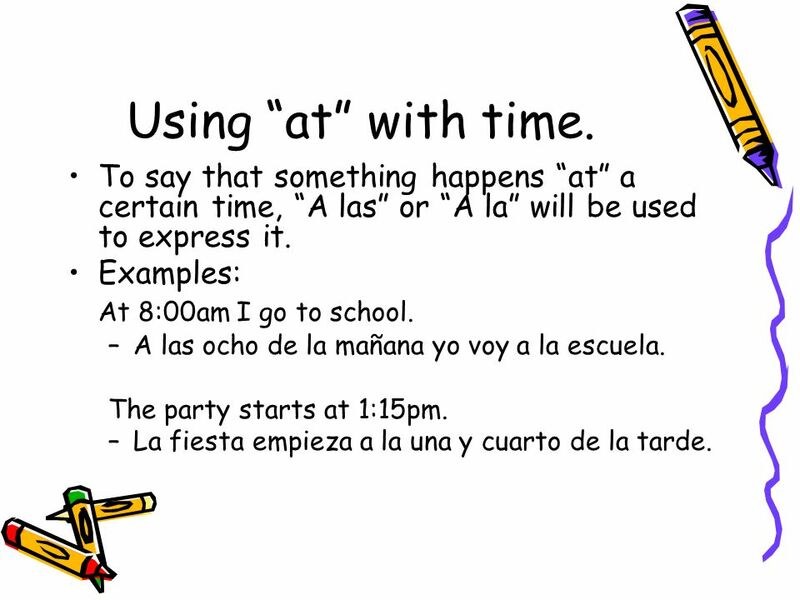 To say that something happens “at” a certain time, “A las” or “A la” will be used to express it. Examples: At 8:00am I go to school. A las ocho de la mañana yo voy a la escuela. The party starts at 1:15pm. La fiesta empieza a la una y cuarto de la tarde. 22 Disclaimer Depending on the region that you visit, time could be heard differently. Most of the Latin America uses the 24 hour military clock (time is told using 24 hours). 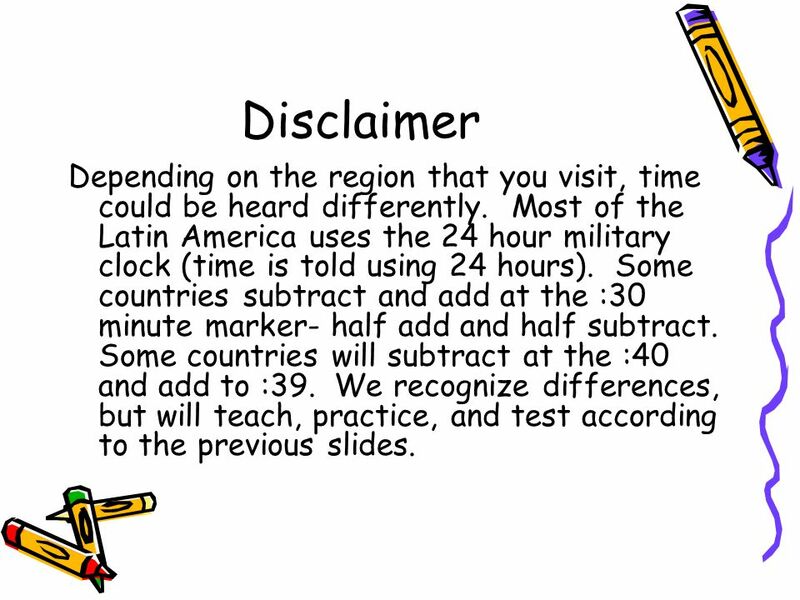 Some countries subtract and add at the :30 minute marker- half add and half subtract. Some countries will subtract at the :40 and add to :39. 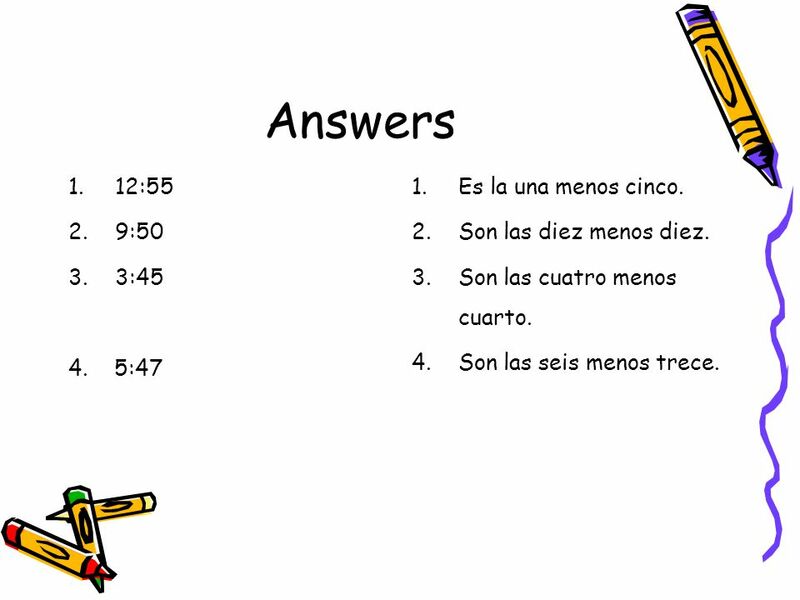 We recognize differences, but will teach, practice, and test according to the previous slides. 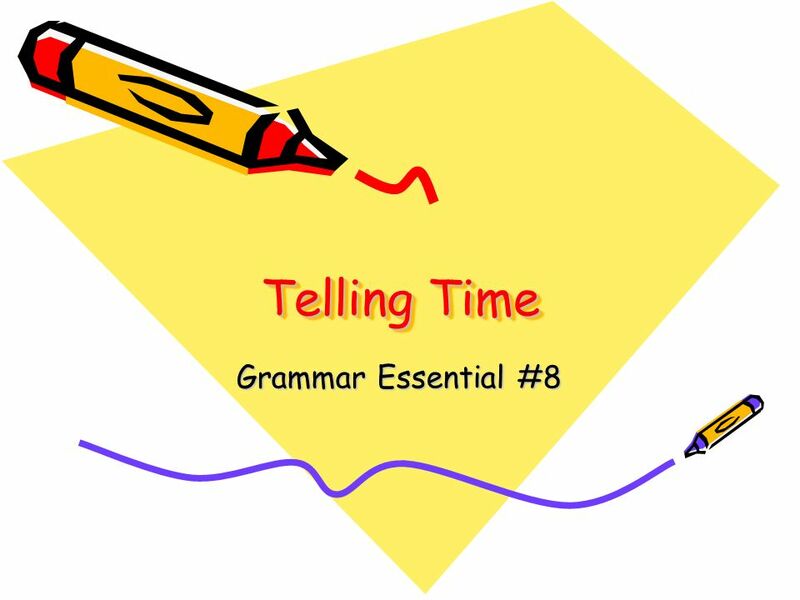 Descargar ppt "Telling Time Grammar Essential #8."